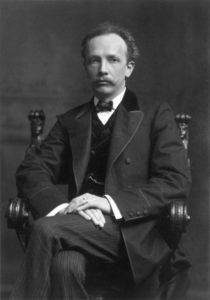 Richard Strauss was born in Munich, Germany on June 11th 1864. His mother, Josephine, was an heiress of the Pschorr brewing dynasty, a famous name in German beer and his father was Franz Joseph Strauss. Franz was the principal horn player of the Bavarian Court Opera for more than 40 years, a teacher at the Royal School of Music, Munich, and a conductor. Strauss’s father made sure that Richard had a solid music education and undoubtedly had a crucial influence on his son’s developing taste. As early as the age of six, Strauss was already composing his first pieces. By his 18th birthday, he had composed 140 works. Not only did he write some of the most famous opera repertoire, tonal poems, and orchestral pieces, but was also the principal conductor at 3 major European opera houses, and was known to be an obsessive card player. 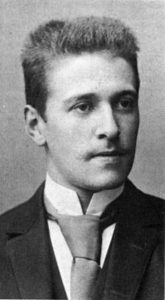 Hugo von Hofmannsthal was born in Landstraße, Vienna on February 1st, 1874. He was the son of an upper-class Christian Austrian mother, Anna Maria Josefa Fohleutner, and a Christian Austrian–Italian bank manager, Hugo August Peter Hofmann, Edler von Hofmannsthal. He began to write poems and plays from an early age. Some of his early works were written under pseudonyms, such as Loris Melikow and Theophil Morren, because he was not allowed to publish as a student. He studied law and later philosophy in Vienna but decided to devote himself to writing upon graduating in 1901. Along with Peter Altenberg and Arthur Schnitzler, he was a member of the avant garde group, Jung Wien, a society of fin de siècle writers who met in Vienna’s Café Griensteidl and other nearby coffeehouses in the late nineteenth century. Hofmannsthal had a successful and independent career as a writer of some of Austria’s finest lyric poetry, and his plays remain in the repertoire of German-speaking theater. He was strongly influenced by the neo-romantic movement and European symbolism. Hofmannsthal met Richard Strauss for the first time while on holiday in Paris, France in 1900. The collaboration between these two artists resulted in six operas: Elektra (1909), Der Rosenkavalier (1911) with Harry von Kessler, Ariadne auf Naxos (1912, rev. 1916), Die Frau ohne Schatten (1919), Die ägyptische Helena (1928), and Arabella (1933). They worked closely with director Max Reinhardt who was made responsible for creating effective staging and production. Strauss and Hofmannsthal, along with Reinhardt, scenic designer Alfred Rolle, and the conductor Franz Schalk founded the Salzburg Festival in 1920 as a way to celebrate the beauty of culture in the wake of World War I with the performance of Hofmannsthal’s Jedermann. 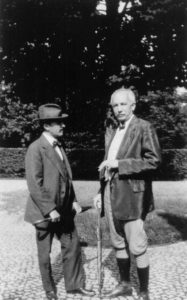 The collaboration between Richard Strauss and Hugo von Hofmannsthal was one of the greatest composer–librettist relationships of all time, spanning nearly three decades. As with most great partnerships, they respected each other as masters of their own crafts, but they were not without their disagreements. In fact, one example of this is while they were working on Die ägyptische Helena. Strauss occasionally misread/ignored Hofmannsthal’s punctuations. One instance occurs in one of the lines the poet had given to Helena. This error changed the meaning and intention of the text, and when Strauss realized his mistake, he sent a card to Hofmannsthal asking him to change the words to fit the melody. Strauss was so impressed with the music he had written and did not plan to change it. Hofmannsthal felt so strongly about the words he had chosen and thus refused. Strauss ultimately altered his notes to suit Hofmannsthal’s original text. When Strauss spoke about his partnership with Hofmannsthal he had said, ‘No musician ever found such a helper and supporter’. The partnership had a particularly tragic end, when Hofmannsthal died of a stroke in July of 1929, two days after his son Franz had committed suicide. Strauss had sent a telegram to Hofmannsthal between those two days, to congratulate him on the great work he did are Arabella, however sadly Hofmannsthal never saw the telegram or the results of that work. Strauss went into a deep depression after learning of his friend’s death. Strauss wrote, ‘No one will ever replace him for me or the world of music!’. Come experience this lush and dramatic work, a rare offering by one of opera’s greatest creative teams, in our one night only concert event you will not want to miss!